A comprehensive service to assist you in compliance with the Recreational Craft Directive. This includes advice during the build and a final inspection. All the paperwork required, including the Owner's Manual and the Declaration of Conformity, is produced for you. Stability is also assessed, including a heel test (as shown in the photograph). To enable new vessels to be freely sold or transferred anywhere within the Economic Union (EU), a Recreational Craft Directive (RCD) was issued. This Directive, plus amendments, stipulates Essential Requirements (ERs) which have to be met and conformity with the ERs allows the craft to be CE marked. In simple terms, under the Directive, all complete boats first used, sold or transferred, for recreational purposes, must meet the ERs and be CE marked – by law. However, it should be noted that the Directive only relates to the first use, sale or transfer, with no requirement for compliance with the Directive after that date, unless the craft goes through major craft conversion. Further, there is no requirement for a vessel CE marked when first used, sold or transferred to be maintained to the Directive. Therefore, the CE marking of a second-hand craft for sale does not guarantee that it is fit for the purpose or has been maintained to any particular standard. Watercraft Identification Number (WIN), Builder's Plate and Owner's Manual. The boat builder, or whoever places the vessel on the market, or transfers the craft, must show that the ERs have been addressed. This can be by reference to published standards, such as British Standards, or other means, such as documented history of satisfactory performance. 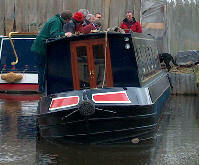 The Boat Safety Scheme (detailed elsewhere) can not primarily be used as a reference. Part-completed craft have to be CE marked to show conformity to the RCD when ownership transfers from the professional builder to the first owner. The Declaration of Conformity from the builder for such craft, should list only the ERs which have been met at the point of sale and how they have been met. Craft built for own use and not sold or transferred within 5 years. Note: If sold before 5 years, then the carft has to go through Post Construction Assessment via a Notified Body, such as HPI Verification. Please refer to Trading Standards.